The long weekend is here. Yes! That's a strangely-wrapped thing of nachos, which we had never seen presented that way before. Some chicken wings in the middle. And a few soft pretzels on the left. The nachos were not only presented in a strange way, wrapped in paper, but were skimpy in terms of the stuff that was on them. There was some cheese, but not the quantity one would typically expect. 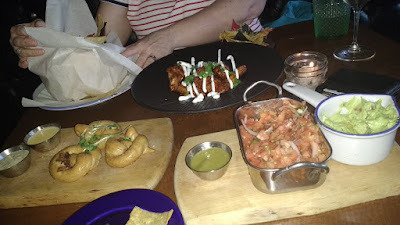 The salsa and the guacamole in the foreground were what you were supposed to dip the nachos in prior to stuffing them in our pie hole. The salsa in the above picture looks like uncooked hamburger. The guacamole was not smashed up enough. There was a big chunk in the middle that Patricia mashed up on her own using her brute strength (of character). The salsa was okay. The little ramekin on the left was some damn thing or other that didn't taste like anything I would want to put in my mouth. The pretzels were fine. Nice cheese sauce to dip them into. But with only three of them, we had to cut one in half to be equitable. Patricia found the chicken wings too spicy. Only ate one. I managed to finish them. Acceptable. She had a glass of Tidal Bay Wine from Pete Luckett's vineyard in the Valley. She reported it was fine. There are, well, a lot of wineries in the Annapolis Valley. Pushing 20 last I heard. That part of the province is hoping to be like California's Napa Valley, I suppose, but my knowledge of wine is so scant that I will never be able to be in a position to judge. I fear, however, that the area can only support so many wineries, so I wonder how long they can keep building new ones before some of them fold. The bill came to just over $30, so it would have been nearly twice that amount (the wine is discounted by two dollars a glass during happy hour) for what we ate. Not nearly worth that much, but at half price, I could live with it. We drove home. Watched some tv. And around 10, we both started to doze off. I woke up long enough to write this blog post, but already my eyes are getting heavy. You guys have a good evening. I will bark at you tomorrow.